An alumni-owned brewing company stays competitive by crafting 270 beers in Melbourne. Intracoastal Brewery Co. may have embraced the boost in business brought on by the growing craft beer industry, but it plans to keep the local vibes of the Melbourne area flowing strong. Intracoastal Brewing Co. was founded two years ago by John Curtis, Donald Atwell and Kyle Smyth. It keeps a competitive edge by crafting hundreds of beers specific to the small Melbourne brewery. “We bring out a lot of favorites, but we keep brewing different beers that people want to enjoy so when they come back, they’re able to taste some of the fun things that we had before, but they’re able to taste some of the fun things that we haven’t done, and that’s where I think that we stand out,” Curtis said. Brewmaster Atwell has created over 270 unique craft beers for Intracoastal, and said that he enjoys the creativity that comes with his job. Brews on tap include Rice Krispies Treat Cream Ale and Live Free or Apple Pie. The brewery, which was voted best local brewery by SpaceCoast Living, boasts a friendly atmosphere that complements its menu of rotating, in-house beers. A long row of picnic tables covered in the signatures and drawings from hundreds of customers stands as a testament to the many faces who have come through the brewery’s doors. Smyth said that the company plans to expand around Brevard and into Central Florida, but the Brevard-based brewery wants to keep the niche of its ever-changing menu. There are a total of 111 craft breweries in Florida with more than 75 having popped up in the last two years. Smyth said that he is excited to be a part of such a growing industry. 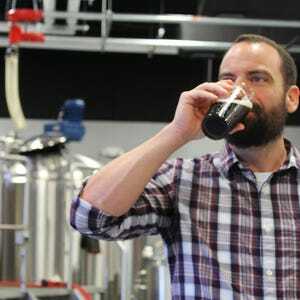 “It’s cool because it means the economy is thriving, and Florida is finally getting on board with craft beer, which hasn’t always been the case,” Smyth said. To stay relevant, Intracoastal will have to make some changes in the near future, Smyth said. Curtis said they aim to adapt quickly to any changes in the brewery market while remaining competitive yet friendly, and Smyth said he’s enthusiastic about the rapidly growing number of craft breweries, but hopes they live up to a high standard. “We want to get our beer out a little bit more and we want to be players in the different fields of what breweries are opened up around us,” Curtis said. Sarah Gangraw is a contributing writer for the Central Florida Future.